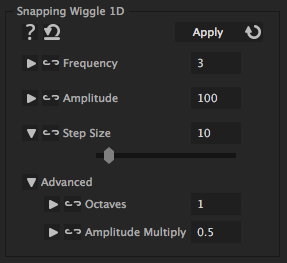 This wiggle adds a noise in fixed steps of a given size. If applied to rotation, you can use it, for example, to randomly move the hands of a watch, ensuring that it always points to a full second or hour. number of octaves of noise to add together. The more octaves the more detail is in the wiggle.